Cleaning debris and grass clippings from the bottom of a lawn mower deck after each use is a crucial step in maintenance. Mowing when grass is wet from dew or rainfall allows it to stick to the underside of a mower deck above and around the blades. Thick debris prevents blades from turning as they should and decreases the airflow from underneath needed for cooling purposes. Wet grass clippings hold moisture within the deck and cause rust to form. However, it takes just a few minutes of cleaning after each mowing to protect your investment. 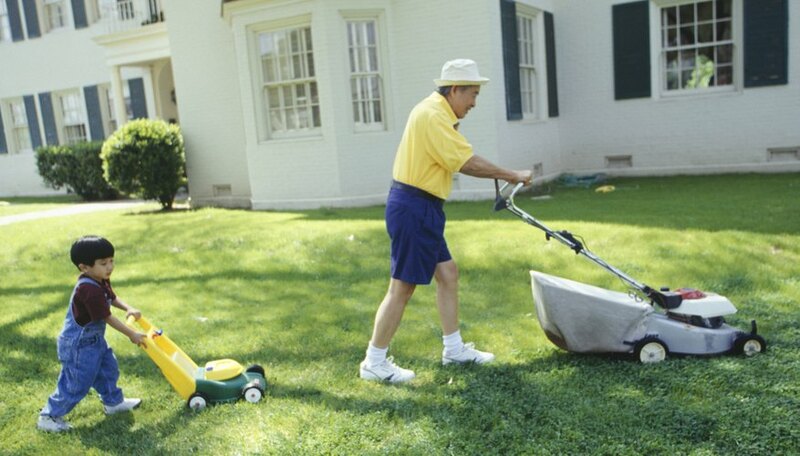 Turn the push lawn mower's engine off, place it in a flat area of the lawn and allow it to cool. Rotate the handle down so it is touching the ground. Place a cinder block or other heavy object on the center of the handle to keep the handle on the ground. Turn a garden hose nozzle to the strongest stream of water. Turn the hose on and spray the bottom of the lawn mower deck. Remove any grass stuck to the deck with a plastic ice scraper and continue to spray water until all debris falls from the underside of the mower deck. Allow the deck to dry completely. Once the deck has dried, spray a coating of aerosol silicone lubricant on the entire bottom deck surface. Turn the riding mower off and park it on a flat surface. Allow the engine to cool slightly. Raise the deck to its highest setting. Pull the spark plug boot off the spark plug to disconnect the spark plug, which will prevent accidental starts. Turn a garden hose nozzle to its strongest stream. Turn the hose on, squat next to the mower deck and direct the stream of water underneath to remove wet grass. Scrape any excess debris off the mower deck with a plastic ice scraper and wash the remnants off with water. Let the mower air-dry. Once the mower is dry, spray it with aerosol silicone lubricant on the underside. Replace the spark plug boot on the spark plug. Remove the grass catcher and side discharge chute from your riding mower. Slide the mulch plug into the side discharge. Drive the lawn mower to a flat, level area and turn the engine off. Lower the grass cut length to the shortest level. Screw the male end of a garden hose to the washout port on the mower deck. Turn the water onto the maximum water flow. Start the lawn mower engine and observe the debris flying out from under the deck. When no more debris comes out, stop the engine, disconnect the garden hose and run the engine another two or three minutes to complete the deck cleaning cycle. Use plastic ice scrapers instead of metal paint scrapers, which can cut into the metal and eventually cause rust, which can develop into holes. Damp grass clippings are easier to clean if you address them before they dry underneath the lawn mower. Wear gloves during any work around the lawn mower blades to protect your hands.